MLB paternity leave controversy: A happy ending to the Boomer Esiason flap. 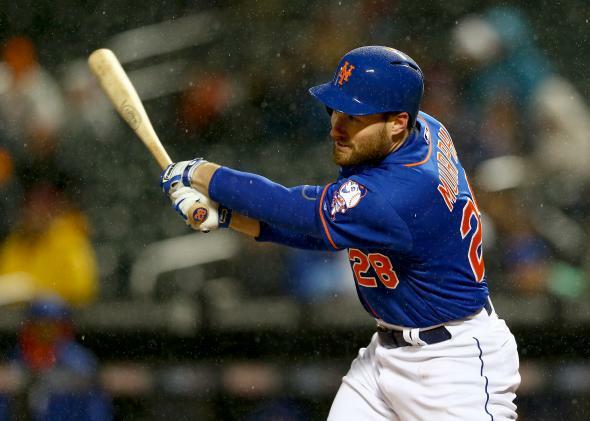 Daniel Murphy of the New York Mets hits a single on April 4, 2014, a few days after his son was born. Last week, Mets second baseman Daniel Murphy took his contractually guaranteed three days of paternity leave so he could be with his wife, Victoria, while she had a cesarean section and could help out with their newborn baby. Murphy missed two games, including the season opener, and endured the boneheaded commentary of two sports radio hosts, Mike Francesa and Boomer Esiason. * Most galling was Esiason, who remarked on Wednesday, “Quite frankly, I would’ve said, ‘C-section before the season starts. I need to be at opening day.’ ” Who cares about ripping a child out of the womb before he is ready when opening day is happening! But that was last week. What’s notable this week is what a noncontroversy this all turned out to be. And what’s remarkable about Esiason’s comment in hindsight is not the idiotic statement itself, but the monumental backlash to it and his subsequent apology, which came two days later. Among other things, Esiason said, “I apologize for putting [Murphy] and his wife in the midst of a public discussion that I basically started by uttering insensitive comments.” That Esiason felt he had to eat such major crow shows how far we’ve come in our cultural perception of a father’s role, and it also suggests a shifting of the tides when it comes to our feelings about paternity leave. Three days of paternity leave has been part of Major League Baseball’s collective bargaining agreement since 2011. Players already had up to seven days of bereavement leave—which allowed teams to replace the grieving player on the active roster—and having paternity leave on the books now allows teams to replace new dads in the same way. Some fathers did take leave before MLB’s paternity leave was in place (César Izturis did so in 2006), but it left their teams in a rough spot because they could not be replaced on the active roster. That players lobbied for and MLB put paternity leave in place is a positive step for pro sports. Even more heartening is that every time someone makes a snide remark about that leave, he gets shouted down. Texas Rangers’ pitcher Colby Lewis was the first MLB player to be put on the new paternity leave list in 2011. At the time Richie Whitt, a columnist for the Dallas Observer, complained about Lewis taking the leave because he is so highly compensated and suggested that MLB players schedule births for the off-season. And just like with Esiason’s comments, tons of people piled on Whitt. And when sports columnist Mike Florio criticized Bears football player Charles Tillman (not protected by an official paternity-leave policy) for saying he might miss a game for the birth of his child, he got an earful, too, and eventually reconsidered. Remember, Boomer Esiason is 52 years old. Mike Francesa, the other sports radio blowhard complaining about Murphy’s paternity leave, is 60. They don’t represent the current crop of new dads who have a new model and a new attitude when it comes to parenting. For his part, Murphy took the criticism in stride. He told ESPN that he felt it was the “right decision” for his family and described the following late night new dad scene: “It was dark. [My wife] tried to change a diaper—couldn’t do it. I came in. It was just the three of us at 3 o’clock in the morning, all freaking out.” Murphy standing up for himself and bragging about changing a diaper? He’s the future. Actually, he’s the present. Esiason is the past. Correction, April 7, 2014: This post originally misspelled Mike Francesa’s last name.